Aikatsu Stars! – 096 | Mezashite! There’s a lot that I can express here in words, but as is my policy I want everyone to experience it for themselves first. I’ll just say that my expectations were exceeded. I devote this episode to Yume, in celebration of her birthday. Happy Birthday, Yume-chan. I’m at such a loss for words. In no way could I have expected Stars to pull out such an emotional and beautiful resolution for Elza. Not to mention, the animation?! Gorgeous. Yume? AMAZING. I’m astounded at how well this turned out. In real life, they would have been manhandled to the ground by hordes of bodyguards, Carol-tan included and sent to maximum security prison immediately. Stars on the whole has exceeded my expectations. Thank you so much for bringing it to us this whole time and for everything else you do. Aikatsu Stars has been a wonderful experience indeed. It honestly was one of those situations where a lot of trouble could have been avoided if people had just… talked. But that’s the beauty of human drama, isn’t it? Always looks easy from the outside. 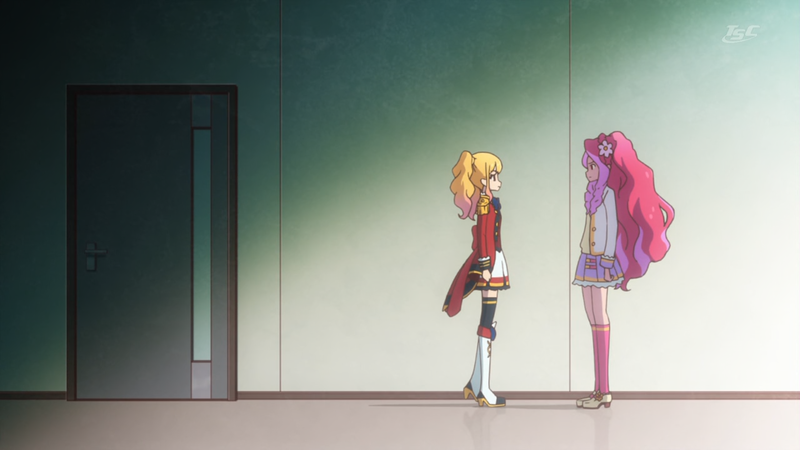 People don’t talk in real life, either, but at least Aikatsu Stars has a hell of a lot more optimism and resolution than real-life conflicts do. Where you say you have a lot you can express in words, I’m at a total loss. I never would have imagined the possibility, but Stars might have surpassed the original Aikatsu. Fantastic. Her aura dedicated to all those who supported her in so many ways, that’s the Gift of the Phoenix. During Yume’s performance, smaller auras representing the other characters briefly appear around her when she obtains the Sun Dress. While episode was wonderful, i wish Yume would won without getting Sun Dress, Elza had it, since it is embodiment of perfection, but, like Hime said “Being perfect doesn’t mean being the best”. I think that was the point. Elza had it wrong. Yes, she got the sun dress because she was perfect, but Yume could still get the sun dress even without being perfect, because of her friends. Chances are, when the VA girls perform Bon Bon Voyage next week, they will all get their sun dresses too. I wouldn’t count on that happening. The only Sun Dresses that made it into the anime adaptation are Elza’s Eternal Queen Coord and Yume’s Eternal Rainbow Coord, with Hime’s Eternal Princess Coord possibly coming in the finale.